Right then – Easter is almost upon us so I felt it best to farewell the last of the warmish evenings with a spread perfectly designed to enjoy over the long weekend. Despite being single I still absolutely love gathering all of my old (not ‘old’ – ‘long standing’) friends around the table as often as I can – and this is exactly the kind of thing that I serve up. 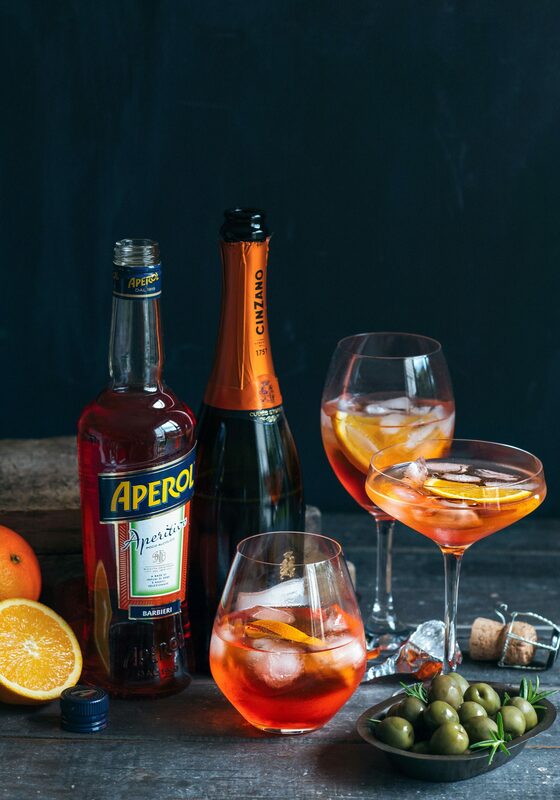 It seemed like serendipity when I was approached by Aperol to collaborate with them, (it is the world’s most natural fit) so I leapt at the chance to show off their classic Aperol Spritz (which I served up at my big birthday bash last year) with one of my absolute favourite pizzas. For a laid back night with friends I often start with a bowl loaded with plump green olives and a board of prosciutto and buffalo mozzarella – several drinks later and it’s onto a few super-quick pizzas. 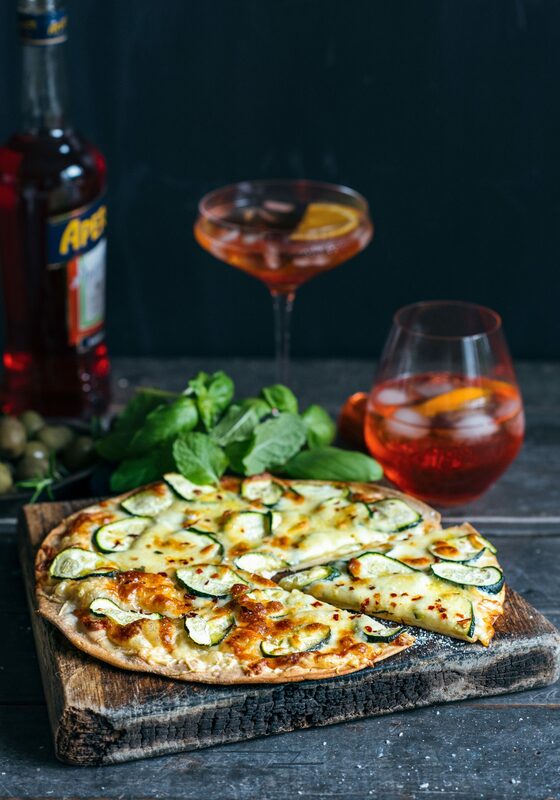 The base is thin and crispy, loaded with a blend of sharp Parmesan and mellow mozzarella, topped with flash grilled zucchini, a zing of lemon and a hit of chilli. Add a little sea salt, a drizzle of lemon (or extra virgin) olive oil and a sprinkling of vibrant mint and it is completely irresistible. The whole thing (aside from bases) is ready in 15 minutes from prep to table. The serving size of the pizza depends on appetite – I eat half of one, but my men/boys eat one each – so if you work on 1 each for most of the blokes and 2 pizzas for 3 chicks and that is usually about right. This Easter I am zooming down to Welly to see Hoob on an overnighter – and I bloody can’t wait. We will have a few drinks, a good catch up and dinner on Saturday night and a lazy brunch on the Sunday morning before I head back – so it is a multiple bonus trip: see my gorgeous Rich, eat out, have a night off from the dogs (heavenly, much as I love them), and get out of dodge for the night. Then back in town I will gather what remains of the troops that haven’t headed away for the whole weekend and replicate the menu above – the easiest entertaining ever! Meanwhile Pog and Will will be hooking into (I hope) the gourmet chocolate delights I sent them and making the most of a few days off together in Melbourne before the countdown to Henry’s trip begins in earnest. However you spend Easter, hanging out with friends, surrounded by family, or even flying solo – wishing you a safe and happy time – cheers to you! Drizzle the whole lot in a good extra virgin olive oil and season the mozzarella with sea salt and freshly ground black pepper. Pre heat the oven to super hot – I use about 220˚C, and put an oven tray in to heat up. Sprinkle grated Paremsan and half of the grated mozzarella over the pizza base. Lay zucchini on top in a single layer and top with remaining grated and torn mozzarella. Sprinkle over sea salt, black pepper, lemon zest and chilli flakes and bake 8-10 minutes until golden and bubbling. Serve with a generous garnish of mint leaves and an aperol spritz or 3! I’ve been having trouble even getting motivated to cook lately – being unwell and unhappy hasn’t helped! This looks amazing and I can smell it as I read – that’s always a good sign. Roll on Good Friday and pizzas! I’m so sorry to hear you’ve lost your cooking mojo and been unwell…I really hope you love the pizzas like I do, and feel better soon! can I say ……… fugging yum and I have my mojo back!!! !